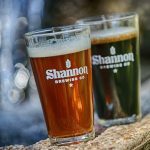 North Texas has had its fair share of brewery openings the past two years, but nary a one that is dedicated strictly to Irish beers. Shannon Carter is set to change that. Last month the City of Keller approved Carter’s plans for Shannon Brewing Co., which he hopes to officially open in February. There are a few things that will seperate this brewery from the pack. For one, Carter uses old family brewing secrets brought over by his great grandfather from Ireland, which includes an old-school fire-brewing process. And because water is such an important aspect in beer, Carter chose a location that grants him access to Samantha Springs, a natural source of drinking water, which he’ll use exclusively for his beer. Carter’s wingman at Shannon Brewing is Dan Sartin, a West Point graduate and former Army Defensive End, who is the only certified bier sommelier in the state of Texas. (Yes, they make those now.) In 2012, Sartin enrolled in the first class of the Doemens Beer Sommelier Course at the Siebel Institute of Technology, America’s oldest brewing school based in Chicago. Carter and Sartin hope to pour their first pints in February of 2014. Recently we chatted with Carter about the business of opening a brewery. So, opening a brewing: Hard or easy? This a tricky question. I had a pretty good idea of the challenges in front of me, but the process has still proven to be more challenging than I expected. The City of Keller has been very supportive of the brewery. Additionally, public support and enthusiasm has been awesome. The licensing process proved to be a bit challenging — our federal license got caught in the government shutdown, but seems to be back on track. What are some of the trickier aspects of convincing other people to give you a lot of money to make booze? Five or ten years ago did you think you would have a brewery in North Texas? Ten years ago, no way. I was a happy home brewer with a growing business in Austin. Five years ago, absolutely! I have been single-focused on opening this brewery for about five years. My wife might call my focus an obsession, but she is completely onboard and very excited about the brewery. She even helps me brew sometimes. What’s the one moment you’re looking forward to the most? Sitting down in our new tasting room and tipping a pint with all the people who helped make this happen.